Latent Semantic Indexing(LSI) is a common technique in natural language processing area. 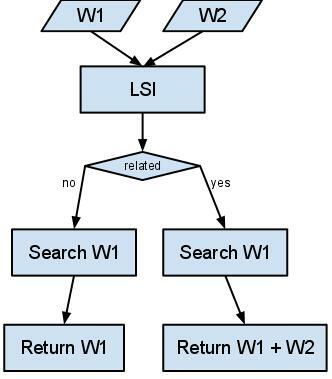 This article is about how LSI works by comparing the pure key-word-based search. For example, Paris and Hilton are associated with a woman instead of a city and a hotel, Tiger and Woods are associated with golf. By using regular keyword search, a document either contains the given word or not, and there is no middle ground. LSI adds an important step to the document indexing process. LSI examines a collection of documents to see which documents contain some of those same words. LSI considers documents that have many words in common to be semantically close, and ones with less words in common to be less close. When you search an LSI-indexed database, the search engine looks at similarity values it has calculated for every content word, and returns the documents that it thinks best fit the query. Because two documents may be semantically very close even if they do not share a particular keyword, LSI does not require an exact match to return useful results. Where a plain keyword search will fail if there is no exact match, LSI will often return relevant documents that don't contain the keyword at all. If we use LSI to index a collection of articles and the words “program” and “code” appear together frequently enough, the search algorithm will notice that the two terms are semantically close. A search for “program” will therefore return a set of articles containing that phrase, but also articles that contain just the word “code”. LSI does not understand the word distance, but by examining a sufficient number of documents, it knows the two terms are related. It then uses that information to provide an expanded set of results with better recall than a plain keyword search. The diagram below describe the effect between LSI and keyword search. W stands for a document. Nice article. There are some indication that RankBrain algorithm will eliminate the need for LSI keywords. What is your view on that?